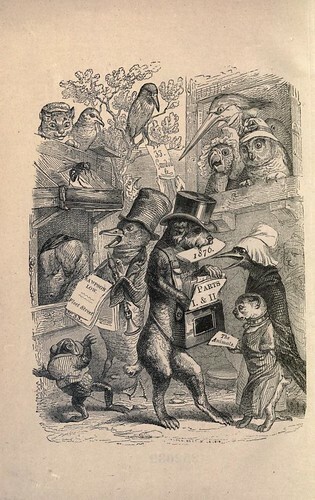 The frontispiece of Public and Private Life of Animals, by P. J. Stahl, illustrated by J. J. Grandville, and translated rom the French by J. Thompson; 1877; London, S. Low, Marston, Searle, & Rivington. This collection of acerbic animal fables, originally published in 1842 as Scènes de la vie privée et publique des animaux, boasts among its contributors some of the finest literary minds of mid 19th-century France, including Honoré de Balzac, George Sand, and the publisher Pierre-Jules Hetzel (under the pseudonym of P. J. Stahl). The book is also home to some of the finest work (some featured below) by the caricaturist J. J. Grandville, drawings in which we can see the satirical genius and inventiveness that would be unleashed in full glory just two years later with the publication of his wonderful Un autre monde. See more at Public Domain Review; and visit the original at the Internet Archive. As we anthropomorphize, we might send carefully-limned birthday greetings to Joesph Stella; he was born on this date in 1877. An accomplished illustrator, he is better known as a Futurist painter, perhaps especially for his depictions of industrial America and his images of the Brooklyn Bridge. 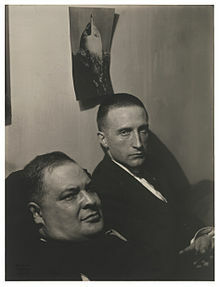 He was one of the many artists to break out as a result of the 1913 Armory Show (he was considered by critics as important and influential as Duchamp and Picabia). He was later associated with the American Precisionist movement of the 1910s–1940s.